Even though the original Mega Man failed to sell what Capcom had hoped, they decided to let Keiji Inafune, Mega Man's creator, develop a sequel. The game that came out as a result managed to surpass original game in every way. 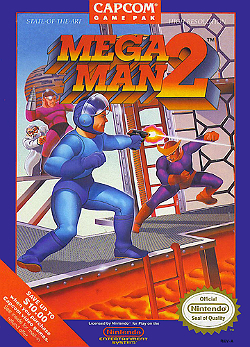 Mega Man 2 is regarded by many to be the finest entry in the Mega Man series for taking the superb concepts of the original game and perfecting them. 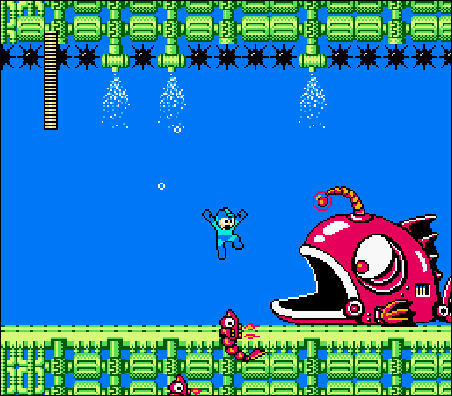 Is Mega Man 2 still the pinnacle in a series filled with classics? The story in Mega Man 2 is even more nonexistent than the first game if you can believe it. 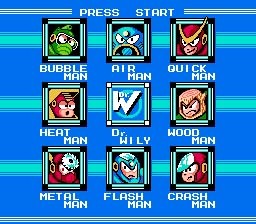 Dr. Wily has created 8 new Robot Masters of his own to defeat Mega Man and conquer the world. It's not much, but it's all you need to justify hunting down some brand new bosses. Mega Man 2 took all the fantastic gameplay concepts from its predecessor and managed to come together and make something even more amazing. More vibrant and colorful levels, more varied enemies, two more bosses and thus more levels, and an even more energetic soundtrack motivating your quest to stop the mad Doctor. The core gameplay from the previous installment remains the same, but Mega Man 2 improves on it by having better level design and some really creative stage themes. Each stage is expertly designed with challenging jumps and well placed enemies. The lone exception to this would be Heat Man's stage. This stage has an overly complicated and much too lengthy section of reappearing and disappearing blocks but it can be skipped with the help of a special item. Speaking of special items, in addition to the powers Mega Man gains from defeating his Robot brothers, he also receives 3 items from Dr. Light upon completing a specific stage. These items serve as platforms to help you progress through the levels with each behaving differently such as one climbing walls while another lets you ride it across pits. Even though the gameplay stayed the same, the subtle improvements in Mega Man 2, like better level desgin and more bosses, help the game rise a step above its predecessor and create a more polished experience overall. Unfortunately there is still one instance of poor game design. The boss of the third level of Dr. Wily's castle requires you to have saved all your weapon energy for the Crash Bomber. If you waste one shot during the boss fight it becomes impossible to win and you'll have to grind for weapon energy after you die. Thankfully this is the only instance of infuriating game design, but it's there nonetheless. The controls in Mega Man 2 remain much the same as the game before it. Mega Man still feels fantastic to control and the slight momentum he had when stopping in the first game was taken out entirely. The graphics in the original Mega Man game were nothing to scoff at. They looked very detailed compared to games like The Legend of Zelda or Castlevania. However, Mega Man 2 puts even its prequel to shame. 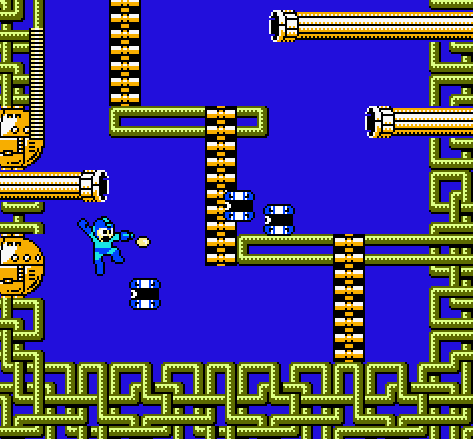 The stages in Mega Man 2 are much more vibrant and varied when compared to the previous entry. Even more so than the first game, the levels all feel directly inspired by the Robot Master they're based on. This helps the game feel a bit more alive and the more colorful palette makes a game that is quite pleasing to look at. 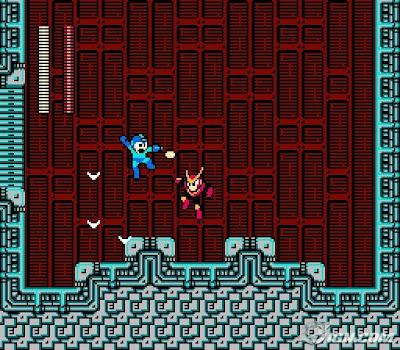 Mega Man was a very challenging game like many NES games at the time. Mega Man is still a difficult game but it's a bit easier overall thanks to various changes the developers made. The invincibility period you receive after being hit by an enemy now protects you from spikes which were instant death in the previous game. Thankfully none of the bosses can kill you in 3 hits either which makes defeating them without their weakness much more possible. 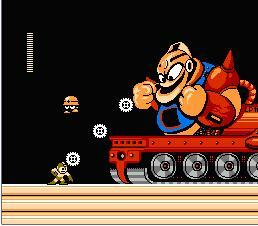 You can also find and item called the E-Tank scattered throughout the 8 stages. You can use these to refill your health at any time, saving you from a tight pinch. The difficulty in Mega Man 2 feels much fairer and more balanced though it's sure to still provide a challenge. Mega Man 2 does what a good sequel should, it takes the concepts from the original game and expands on them to create an improved experience all round. While it isn't my favorite game in the series, it's incredibly fun and well designed levels as well as boss battles make it a highlight of the Mega Man franchise. Hate to be that guy, but under Graphics it's games, not gams. It's fine, I do it to everyone else. I wonder why spell check didn't catch that but whatever. It's worth it to play the original first just to see how much this sequel improves on the formula. Great review, Cap! I want to try a Mega Man game so badly right now, but I have some other games I must finish first. I know you'll get around to it eventually. My Mega Man X review requested by Knuckles is coming soon. @Capn - Cool. Say, have you played the Zero series? If you have, could you review that when you have an opprotunity? I've seen the entire collection available for DS and I'd like to hear your opinion on it. Yes, I'll do the Zero series when I get the chance. Right now i'm concentrating on getting X and 3 done but Zero will come afterwards. The DS Zero collection is a great deal for newcomers as well, since it has an easy mode. 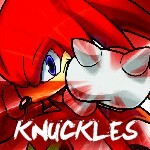 @Capn I just said it for the heck of it, but I do want to hear what a seasoned Mega Man veteran has to say about it. Oh, and have you ever considered the name Pancake Man? I have part of the review done, but it's been taking a little longer than I expected so sorry about that. @Capn I thought you would! Maybe an edited Mega Man, Golden Brown in color, firing Pancakes from his Buster, or maybe Pancake batter. Oh, and take your time, don't make me rush you.